Just before the new year began, I read this verse in my Psalms of Gratitude study. The previous Sunday we were attending the church where I grew up, and my brother preached a message on knowing God’s will. He reminded us that in order to know God’s will, we must know God, and the way to do that is through His Word. With those thoughts in mind when I read this verse, I knew I wanted to focus on this message for 2016. 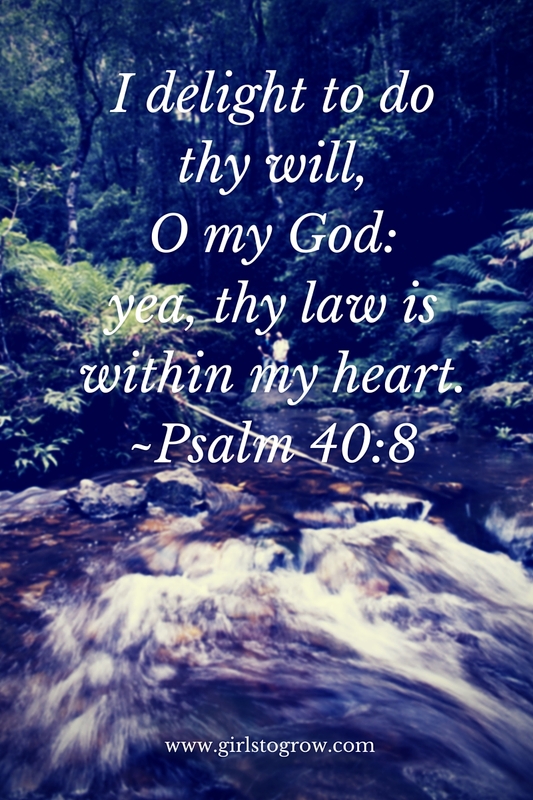 There are two specific ways I’d like to apply Psalm 40:8 in my life. 1. Delighting to do His Will. There are many things in my day that I know are within His will for me. Being kind to others, showing compassion, serving my family, sharing my faith, spending time in prayer, are all actions that please God. But what is my attitude toward doing those things? Do I delight in them? This year I want to! I will need the Holy Spirit’s help, but as He indwells me, I can learn to put self aside and find joy in following His plan for each day. This will lead to my trusting His will above my own, knowing that He will lead me into His joy and peace. Beyond the daily practices, my goal is to pray for my heart to be sensitive to His leading as He reveals other parts of His will for my life. 2. Knowing His Word. For His “law” to get into my hear, I have to read it and meditate on it. I think that’s why I’m enjoying the She Reads Truth app. It’s typically a shorter passage of Scripture that focuses on a single thought or idea for the day. Each season of life lends itself to different methods of Bible study – and I have done and plan to do in the future, longer and more in depth reading and studying – but I hope to use these next few months to concentrate on these shorter passages and Biblical truths and let them sink into my heart. Have you claimed a verse for this year? In what specific area are you seeking to grow spiritually in 2016? What a great idea! And this verse is wonderful. I plan to read through the New Testament this year, focusing on each chapter as I do so that I can get to know His word better. You are so right! I was thinking about that this past weekend – how quickly I'm ready to excuse myself from responding correctly to my family or others because "I have a headache" or "I don't feel well." I pray that God will give me the insight to see that for what it is and help me realize that I need to allow the fruit of His Spirit to come out no matter what my flesh feels like.